ndet. Regular leaf. 85 days. Bi-Color oxhearts are very rare. This new one comes from our good friend, Brad Gates, of Wild Boar Farms. 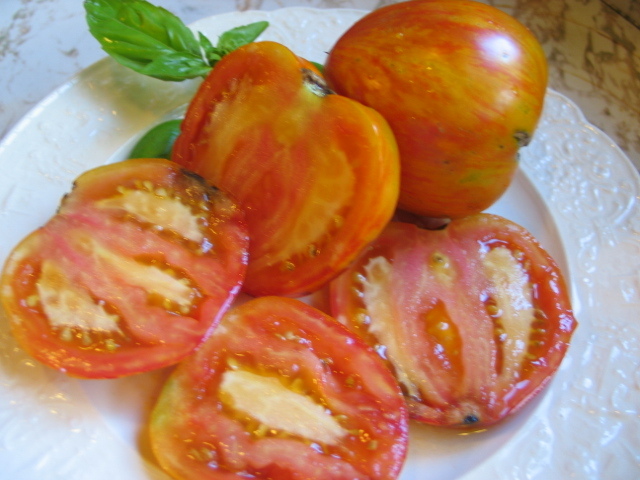 Brad is known for breeding very unusual varieties that possess beauty, but also great flavor. This is another of his outstanding achievements! Twelve to sixteen ounce, heart shaped fruits are medium yellow with deep rose stripes and blushing throughout the flesh. Very meaty, with few seeds and excellent flavor. If you slice this oxheart down the fat side, you will see sheets of water colored, solid tomato flesh. Thank you Bradley, for another great one! Indet. Regular leaf. 85 days. Bi-Color oxhearts are very rare. This new one comes from our good friend, Brad Gates, of Wild Boar Farms. Brad is known for breeding very unusual varieties that possess beauty, but also great flavor. This is another of his outstanding achievements! Twelve to sixteen ounce, heart shaped fruits are medium yellow with deep rose stripes and blushing throughout the flesh. Very meaty, with few seeds and excellent flavor. If you slice this oxheart down the fat side, you will see sheets of water colored, solid tomato flesh. Thank you Bradley, for another great one!